The third meeting of the APAARI Executive Committee for 2009-2010 was held on 24 April 2010 at the National Agricultural Science Complex (NASC), Pusa, New Delhi, India. It was hosted by the Indian Council of Agricultural Research (ICAR). Dr Abd Shukor bin Abd. Rahman, Chairman of the Executive Committee presided over the meeting. The meeting was attended by six members of the Committee and other invitees. Dr. Raj Paroda, Executive Secretary, APAARI welcomed the Chairman, members and other invitees and extended his gratitude to Dr. S. Ayyappan, Director-General of ICAR, and Vice-Chairman of the Executive Committee for hosting the meeting. In his opening address, Dr Abd Shukor appreciated the progress made by APAARI and commended the pivotal role of APAARI team in the GCARD conference held in March 2010 in France. He expressed concern about least developing countries in the region where the ARD efforts still fall far short of the desired level. He felt that APAARI needs to explore opportunities for a collective endeavour of its members for donor support to ARD in the Asia-Pacific region. In the introductory remarks, Dr S. Ayyappan impressed with the progress made by APAARI and conveyed willingness to host an Expert Consultation on Transboundary Pests and Diseases in India. Dr Raghunath Ghodake, Director General of NARI, Papua New Guinea shared his experience of workshop on Fast Growing Economies’ Role in Global Agricultural Research for Development held in organized by the Chinese Academy of Agricultural Science (CAAS) and supported by the Global Forum on Agricultural Research (GFAR) in Beijing from 8 to 10 February 2010. Dr Robert Zeigler, Director General, IRRI (International Rice Research Institute) assured to facilitate participation of APAARI in the ASEAN Forum. Mr Raul Montemayor, IFAP (International Federation of Agricultural Federation) assured collaboration between IFAP (Asia) and APAARI. Dr Raju Barwale of Mahyco Seed Company desired more collaboration and involvement of private sector in future activities and offered funding support for the publication on Bt Brinjal by APCoAB. • Rural Development Authority (RDA), the Republic of Korea confirmed the hosting of International Symposium on Sustainable Agricultural Development and Use of Agrobiodiversity in the Asia-Pacific Region and the APAARI biennial 11th General Assembly Meeting to be held on 13-15 October 2010. • The XI Meeting of Steering Committee of APCoAB was held on 26 October 2009 in Taichung, Taiwan. The Work Plan for 2010 was submitted and was approved for implementation. • The VIII Meeting of Steering Committee of APARIS was held on 29 October 2009 at FAO RAP, Bangkok, Thailand. The Work Plan for 2010 was submitted and was approved for implementation. • Expert Consultation on Biopesticides and Biofertilizers for Sustainable Agriculture was held on 27-29 October 2009, at Taiwan Agricultural Research Institute, Taichung. Proceedings of the meeting have been published. 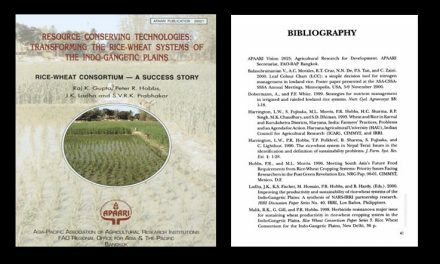 • The Eighth South Asia Network Meeting on Plant Genetic Resources (SANPGR) was held on 1-5 November 2009, at the National Bureau of Plant Genetic Resources (NBPGR), NASC, Pusa, New Delhi, India. The meeting reviewed the status of conservation and use of plant genetic resources for food and agriculture (PGRFA) in Asia and the Pacific. • Training on “In Vitro and Cryopreservation Techniques for Conservation of Plant Genetic Resources” was held on 9-21 November 2009, at the National Bureau of Plant Genetic Resources, NASC, Pusa, New Delhi. The training course emphasized on to overview of in vitro and cryopreservation in plant germplasm conservation. • Workshop on ICM in Agricultural Research for Development was held on 7-11 December 2009, at ICRISAT, Hyderabad, India. APAARI-GFAR-FAO-ICRISAT jointly organized the workshop which was attended by 53 participants from 25 countries and 8 international organizations. • A Policy Forum on Agriculture and Food Security in Asia in the Context of Food and Financial Crisis: Impact, Implementation, Responses and Policy Lessons was held on 23-24 February 2010 at FAO RAP, Bangkok, Thailand. This forum covered the situation studies of 12 countries of the Asia-Pacific region. 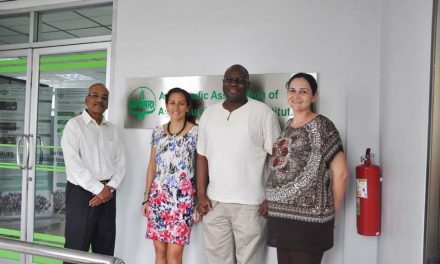 • Dr Raj Paroda briefed on APAARI publications, representation of APAARI in the international fora, and strengthening of APAARI collaboration / partnership with AIT, FAO, NAARAP, IFPRI / ASTI, etc. The progress made by APAARI was appreciated. • Two institutions (i) Northern Marianas College – Cooperative Research, Extension and Education Service (CREES), Northern Mariana Islands, and (ii) University Putra Malaysia have joined APAARI as Affiliate Members in 2010. • Regarding investment of APAARI savings funds, the Committee requested Dr Raghunath Ghodake and Dr Raju Barwale to suggest the fund management strategy for APAARI. • Dr Raj Paroda briefly presented on the outcome of initiatives taken by APAARI concerning “Reorienting Agricultural Research for Development in Asia-Pacific: The Way Ahead”, which was presented and well received at the GCARD held in March 2010, in Montepeiller, France. • On behalf of Dr Mark Holderness, Executive Secretary, GFAR, Dr Raghunath Ghodake presented a briefing on the outcome and implications of GCARD 2010 as well as suggestions for follow-up action to be taken in the Asia-Pacific Region. • Dr Robert Zeigler presented update on Global Rice Science Partnership (GRiSP) Mega Program on increasing and sustaining rice production for the benefit of the poor producers and consumers. It was proposed to organize the regional GRiSP Consultation for Asia and partnership with APAARI stakeholders while developing the full project proposal. The members agreed to endorse GRiSP and also other Mega Programs. Dr Abd Shukor, Chairman and Dr Raj Paroda, Executive Secretary, APAARI thanked Dr S. Ayyappan, Director-General, ICAR for hosting the meeting and also thanked all the members of the Executive Committee for their active and useful support in carrying out APAARI programs.